Free flash games have taken the Internet gaming community by storm. What’s most impressive is how sophisticated these games are becoming. Not so long ago, the best Flash games were tantamount to virtual whack-a-mole. Now we have addictive flash games around which entire social networks are forming. Along the way, we’ve also uncovered a vital piece of information. People love gems. People apparently love virtual gems just as much as the real thing. Not a week goes by without another gem-based Flash game bursting onto the gaming scene. That’s not a bad thing if you’re as crazy about gems as we are. 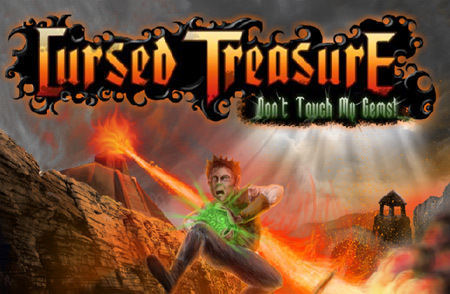 Cursed Treasure from IriySoft is one of the newest flash-based games to deal with gems. However, this one distinguishes itself by being a new take on the Tower Defense game. It mixes in gem elements and Lord of the Rings-style trappings. The theme is straightforward. When you have gems everyone else wants them, and you’d better protect them. 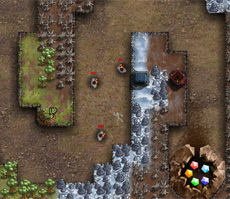 Level after level the gamer protects his or her gems from greedy townsfolk consumed with possessing their riches. Fortunately, the gamer has a steady supply of orcs, undead and demons at their disposal. If you’ve played any Tower Defense game, then you’ll pick this one up immediately. Place your towers strategically to defend your gems. These towers pop up minions in a way that is reminiscent of the creature generators from Gauntlet. Each time you complete a level, you get experience points, and the player can use those XP to purchase additional abilities on a Diablo-style skill tree. This combination of genre elements in Cursed Treasure is is fascinating. There is no shortage of Defense games, and we’re more than a little surprised at how one could distinguish itself so much from the pack as this one does. We must admit that we weren’t expecting much from Cursed Treasure, but what we found was certainly worth our time. The only negative we found is that high-level Defense players may not find a challenge here. Everyone else will.